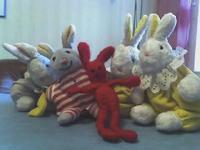 The Red Bunny greets its friends and fellow bunnies, " I became the master of the bunnies in the planet Oulu, because the original bunny inhabitants of the planet had forgotten to exercise their bodily skills as well as the Force. As the image shows, the bunnies on the planet Oulu have evolved physically into a very couch-potatoish form, so the Force guided me to their rescue on the very last minute, just before they deviated like Anakin did. PS. At nights I want to sleep next to my masters Ada and her mother." These greetings were brought to you by my colleague Katja.